ART OF TRANSIT: A ‘CPR Block Party’ was held by the EduLife Institute at five Metro Rail stations on Tuesday, including Union Station. 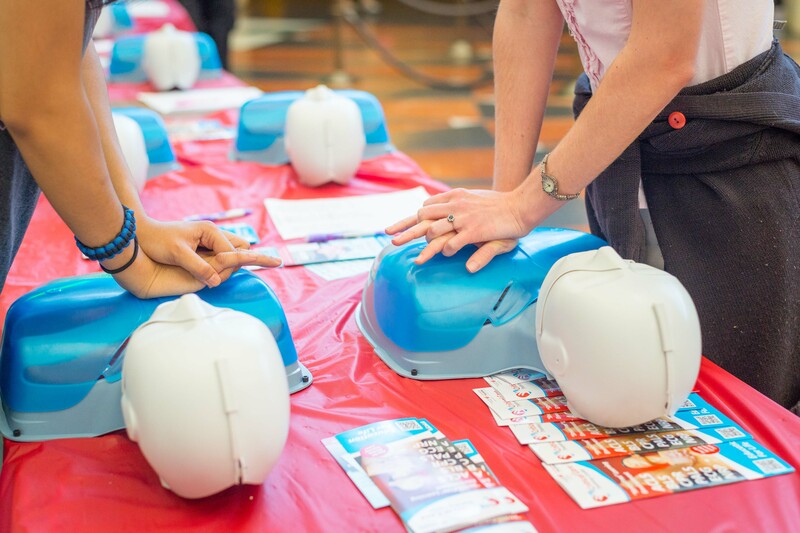 The idea was to train as many people as possible in CPR, a very good cause. Photo by Steve Hymon/Metro. Each of the five Los Angeles County Supervisors are guaranteed seats on the Metro Board of Directors, the 13-member board that has the final say over agency policies, budgets and projects. In the two races to replace term-limited Gloria Molina and Zev Yaroslavsky, the field of candidates has been narrowed. In the first district currently represented by Molina, Hilda Solis captured more than 50 percent of the vote and won, according to unofficial results. In the third district represented by Yaroslavsky, Sheila Kuehl and Bobby Shriver were the two top vote-getters. In the 33rd Congressional district, where the route of the Purple Line Extension under Beverly Hills High School was briefly an issue, the finalists are Elan Carter and Ted Lieu. LAObserved editor Kevin Roderick moderates a panel discussion last week at the Los Angeles Public Library on the history and future of iconic Union Station. It’s appropriate: the station just celebrated its 75th anniversary in early May and this week new details were released by Metro on the emerging Union Station Master Plan, which seeks to preserve the historic nature of the station and add improvements to serve growing crowds of riders who use the station. Here’s a podcast of the event. The mayor on Tuesday announced 15 sections of streets in the city — one per council district — that will get refurbished to attract more pedestrians. The Daily News talks to council members representing the San Fernando Valley and they’re in agreement something needs to be done to attract more businesses to the area. The project has an initial budget of $800,000. Just how great will those great streets become? That’s the question that Joe Linton asks at Streetsblog LA. He is skeptical — but hopeful — believing it takes more than upgraded signs and shrubbery to make an area shine again. This long and academic-minded report comes to the not-surprising conclusion that protected bike lanes in six cities evaluated attract increase bike traffic fairly quickly. And those who already bike, tend to bike more often using the routes. Game One of the Stanley Cup Finals between the Kings and New York Rangers is this afternoon at 5 p.m. at Staples Center, one block from the Pico Station shared by the Blue Line and Expo Line. Have fun, Kings fans and welcome to the Best Coast, Rangers fans! Say your respective prayers. We like the Kings in five games. According to other sources, Solis got over 50% of the vote and; therefore, won the election without any runoff. Thank you for heads up on that. Corrected!